The Overall CCA Programme in the school consists of Modular CCA and Niche CCA (NCCA). Modular CCA is introduced for all pupils. In alignment to PERI recommendation of the Programme for Active Learning (PAL) for lower Primary, PAL will be subsumed as part of the Modular CCA for Primary 1 and Primary 2 (total 2 hours a week). For Primary 3 to Primary 6 pupils, Modular CCA aims to encourage mass participation in sports enrichment, performing arts enrichment and life skills programmes (total 1.5 hours a week). 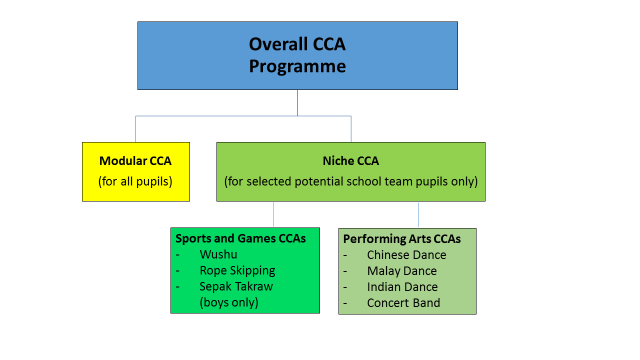 Niche CCA (NCCA) will focus on the school's sports and games and performing arts: namely Sepak Takraw, Rope-Skipping, Wushu, Concert Band, Chinese, Malay and Indian Dances. NCAA is for selected pupils who have opted to take part to these CCA groups and they will be trained for external competitions. Depending on the training schedules, these NCAA may be conducted during Modular CCA timing or outside curricular hours. Pupils will receive separate notifications and consent forms to inform parents of the training schedules and activities if the training is done outside curricular hours.